KUDOS TO SECOND String Music hall of famer and happy hour legend Pete Magliocco, who helped cook dinner last Sunday with Rev. Tony Metz and the good folks at Luther Memorial Church. The meals were for those in need and less fortunate, and the event was a huge success. Click here for more. There are a lot of stories like this that simply don't get told. I have a guitar student who helps out once a week at a food pantry, and it's not in a part of town you might think. We have a lot of people in Quincy struggling to make ends meet. The Quincy Police Department does a food drive in November, right around the time families could really use good news and help. It's organized by a couple of other SSM hall of famers and happy hour guys, Adam Yates and Frank Haxel. Hmmm. Sensing a theme here .... happy hour is good for the soul, and good people who are doing good things! 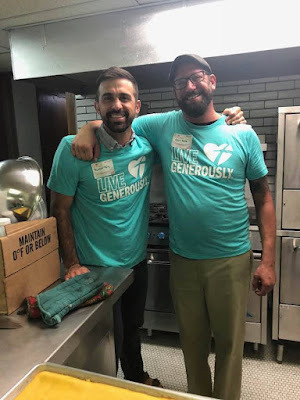 Tony and Pete doing good things!